Add names to these Santa napkin rings and they double as a Christmas event place holder! Quick and easy to make. 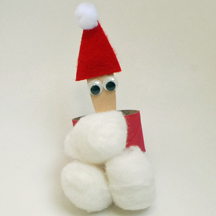 What You Need: Wooden mini spoon (in the craft sticks aisle, or they come with little ice cream tubs); 2 googly eyes; red felt or cardstock; white pom pom; 3 cotton balls; toilet paper or paper towel tube; red tempera paint; scissors; glue. How You Make It: Adults should cut the paper tubes into sections of about 1 1/2″ ahead of time. Kids paint tube red and set aside to dry. Cut triangle shape from felt or cardstock and glue to one end of spoon. Glue pom pom (or a little bit of cotton ball) to top of hat. Glue on eyes. Glue 3 cotton balls to tube. Glue bottom of spoon inside tube. There you have it! This entry was posted on Thursday, November 29th, 2007 at 10:37 am	and is filed under Christmas crafts, paper tube crafts. You can follow any responses to this entry through the RSS 2.0 feed. Responses are currently closed, but you can trackback from your own site.